With a combined total of more than 10 years of experience in operating power tools, the ProTool team spent 30+ hours on product-testing these brad nailers, and further consulted local experts as well. After some deliberation, we reached the consensus that the DEWALT DWP12231 is the best brad nailer currently on the market. While there are pricier brad nailers for professionals, the DEWALT DWP12231 is the most value-for-money, being the perfect fit for novices working on small projects. We defined brad nailer 'value' as a quality that encompasses crucial factors such as durability, ease of operation, and precision. This lightweight, cordless nailer fires away with nary a jam. Place your nails with smooth ease, with this beginner-friendly tool. Require specific features for your brad nailer? Wish to seek out tools at other price points? 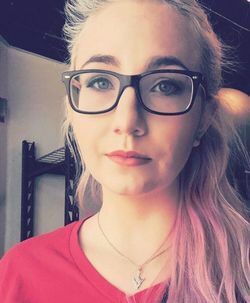 Or just want to consider more choices? Take a look at our selection of high-quality contenders. 12.8" x 3" x 10.8"
This is a selection of high-quality brad nailers that have made our shortlist. We considered a whole spread of weighted factors-- not just the brad nailer's 'power' and consistency, but also safety features, portability, and ergonomics. Nonetheless, it is difficult to strictly rank these tools by overall performance, as they fulfill different niches and budgets, so a lot depends on your specific power tool needs. Read ahead for our detailed testing, to understand what's the most suitable for yourself in particular. Easy-to-aim and easy-to-use, this reasonably-priced pneumatic brad nailer, which accommodates up to 2-inches of brad nails, is the perfect fit for novices. With its smooth firing action and minimal noise, home improvement becomes a breeze. With its tool-free adjustable depth-of-drive, you need not worry about nails penetrating deeply enough. Besides that, it also has a tool-free nail jam mechanism for easier removal of jammed brad nails. The rear exhaust system vents off any debris on your woodwork, while the removable non-marring rubber nose tip prevents leaks and guarantees a clean finish. This nailer also has ergonomic anti-slip rubber grips for comfort and easier handling. For further comfort, attach this nailer to your side by an adjustable belt hook. With its sequential firing mode, worry not about power tool safety or precision. Worry not about efficiency either, as its magazine capacity of 100 nails cuts down on your downtime. This nailer comes with a lightweight magnesium body, a sturdy carry case, and a well-written user manual. It also includes 500 brad nails of 1-1/4 inches in length. Its maintenance cost is low as it comes with a lifetime motor that is maintenance-free, which also keeps the workspace stain-free. This nailer's small nose tip makes it easy for you to place nails precisely into tight and tricky spaces. While marks are inevitable, especially when face nailing, this nailer leaves nearly invisible marks, so do not worry about marring the finish of your works with this power tool. This handy feature comes with a user-friendly detent wheel, and allows you to adjust brad depth with just a few clicks. This can sometimes be a crucial feature for sinking your nails in deep enough. Nonetheless, we recommend that you first try out varying combinations of air pressure, depth-of-drive and brad nail length, on a test piece of wood. All of those features are adjustable. This brad nailer is able to shoot nails from as short as 5/8" to as long as 2", making it a versatile fit for a variety of projects on the small side. This brad nailer is made of durable lightweight material, so worry not about the physical strain of a long project. 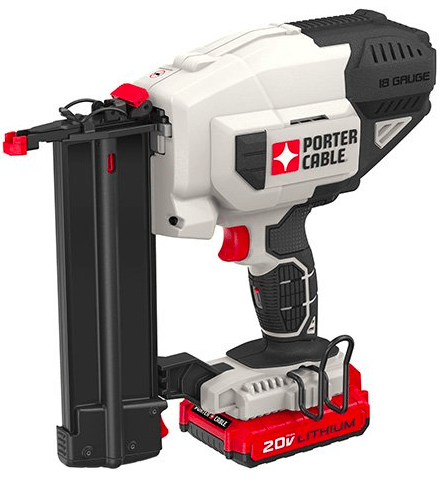 Being cordless, it is also highly portable, so you won't have to lug around an air compressor or air hose. 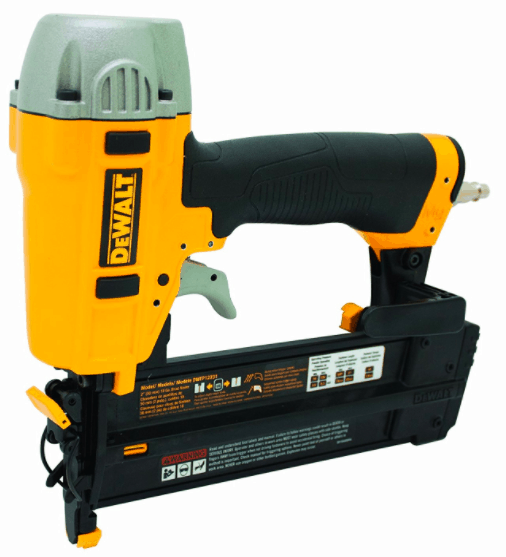 This nailer is battery powered, and comes with one 1.5 Ah 20V MAX Lithium-ion battery you can always recharge with the provided charger. It also features a special kind of motor that can fire brad nails into different materials regardless of the climate. The adjustable nail depth setting, tool-free release lever, and nail jam-release feature, all provide for a breezy home improvement experience. This brad nailer can accommodate brad nails of 5/8-2 inches in length and has a nail magazine with a capacity of 100 brad nails. Its trigger has a lock, and this nailer provides further safety by firing sequentially. Even jazz up your workspace by turning on its multi-purpose dual LED lights! With its long-lasting Lithium-ion battery, you can reduce your downtime as you work, and worry not about finicky, expensive air compressors. You can always carry this brad nailer to any work site without worrying about the power source. You just have to ensure its battery is fully charged, then you can work with it in any remote area. To ensure compatibility, it comes with its own portable charger. Its motor is uniquely designed to handle driving brad nails into a variety of materials, may it be wood or plaster. It also enables this brad nailer to work in a variety of weather conditions without jamming or malfunctioning. Home improvement projects often take hours, but this lightweight, well-balanced nailer eases the strain on you. 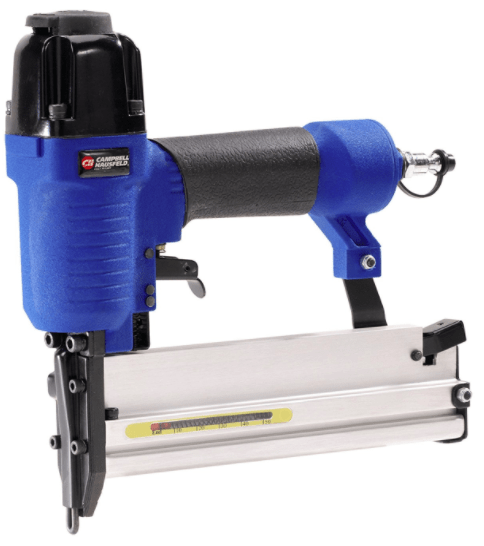 With plenty of power and good trigger control, consider this thrifty nailer for all your small projects. With its dual firing modes, easily customize your experience by selecting between intermittent (for precise firing), and continuous (for rapid firing). This nailer also comes with adjustable depth-of-drive for you to vary the degree of nail penetration, and a high magazine capacity that can accommodate 100 brad nails of different sizes between 5/8 to 2 inches. In addition, its visual nail indicator helps you keep track of nail count so that you wouldn't accidentally dry-fire. This nailer also comes with a comfortably lightweight aluminum body, an elastomer grip handle for further comfort, as well as features for easy clearing of jams and easy loading of nails. Moreover, it features an adjustable exhaust venting system, as well as a non-marring nose cap to protect your workpiece. While this is certainly one sturdy nailer which can fire away for years without issues, the 5-year limited warranty surely provides further reassurance. You can easily choose between a sequential firing option, which is intermittent firing that provides greater safety and precision, and a continuous firing "bump" option, which maximises efficiency. With this nailer, you are able to load up to 100 brad nails at a time into its magazine. This reduces your downtime, making your work hassle-free. The vent is 360 adjustable, so you can adjust the exhaust air to aim in any direction for your convenience, keeping your worksite free of debris. After you've adjusted your nailer's depth of drive, and/or air pressure, make sure to fire a few nails into a scrap piece of wood, to see if you've got the depth right. With an easy-to-click trigger, a comfortable soft-grip handle, and its light weight, this portable atomic brad nailer is perfect for preventing body fatigue. 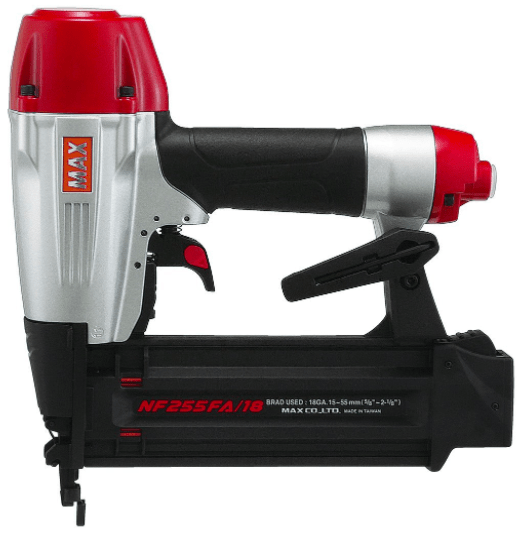 It can easily fire 18 gauge brad nails of 5/8-1 inch length, with consistent nail penetration into hard wood, making this nailer fit for small projects. To reduce time-wasting, this nailer makes for hassle-free clearing of jams and easy loading of nails. Its nail magazine also slides easily for easier re-filling. This brad nailer can only be used on a dedicated electric power circuit, a power strip or any other power dividing system. Its provided electric cord is 8 inches long, so worry not about finding a power source right next to you. This nailer also comes with an adjustable Hi/Lo power, which you can adjust easily using its dial system. Make sure to read its detailed instruction manual. You can easily adjust its power setting from Hi/Lo with just a dial, which makes it very convenient and easy to use. This keeps you in control of it, and ensures you do not exert too much force on it, as doing so could split the wood surface. It comes with a convenient 8-inch electric cord for easier connection to a power source. Besides, this gives you the appropriate safety room between the power source/circuit and the workspace. You can easily connect it to any power strip or device available, and it will work as expected. This brad nailer is the best for home projects, such as piercing small pieces of wood, as well as installing and fastening trims. You can make loads of unique crafts with it due to its versatility, such as doing screen repairs or carpet padding. It can work with either 5/8-2 inch nails or ¼ inch of crown staples. This makes it a thrifty 2-in-1 tool, a non-marring nailer-and-stapler for different kinds of trims and woodwork. You can rely on it for a fast and efficient finish, while its nose tip has a non-marring feature that will keep that finish clean and unmarked too. This tool also has a comfortable grip, adjustable nail depth for precise nail drive, and an exhaust control system for debris prevention. Additionally, it has a 2-in-1 nail magazine for convenient nailing and stapling. It comes with some nails and staples to start you off, as well as a convenient carry case. This feature ensures that your trim is clean and neat for the perfect finish. It also protects the brad nailer from any damage during your work. As a 2-in-1 nailer-and-stapler, this is great for a variety of projects, be it wood trim installation or repairs. This allows you to control the depth of the brad nail, which is crucial for proper installation and a better overall aesthetic. This compressor-type brad nailer comes with dual firing modes that you can easily switch between, using a provided lever. Easily reach tight and tricky spots using its small nose tip, and worry not about fatigue as the tool itself is lightweight and compact. It is ideal for brad nails within 5/8 to 2 1/8 inches, so it fits well with a variety of projects that lean small-scale. Make use of the adjustable depth control system via dial, for proper brad nail setting. Also take note of its screwdriver blade, which lasts four times more than any brad nailer with a pin design. This nailer also comes with an adjustable belt hook for your comfort, and a visual nail indicator to prevent dry-firing. Do not be deceived by its light weight-- this nailer is made from sturdy, high-quality materials to ensure its longevity and durability. This ensures it reaches tight spots without any issues. You can rely on it for just about any kind of woodwork. This allows you to work without worrying about brad nails being jammed, and if they happen to do so, you can clear it in almost no time. This brad nailer can accommodate nails of 5/8 -2 1/8 inches, meaning it can accomplish a relatively great variety of projects without nail jamming. Be sure to comb through the instruction manual, as it often includes crucial safety information, and information you'll need to ensure you don't void your warranty. It was difficult to pick an overall best brad nailer, as a lot depends on your budget and what you plan to use the brad nailer for. Nonetheless, after weighing several factors such as durability, consistency, safety features, and user-friendliness, we conclude the DEWALT DWP1221 to be the most value-for-money and the best for most uses. In this buyer’s guide, you will get to know more about brad nailers, their types, functions, and level of maintenance as well as buying tips. So, read on and know why brad nailers often stand out from the rest of the nail guns. You should place your sole trust in all our recommendations as well as guides and tips when it comes to buying any brad nailer. This is because we have done thorough research on some quality brad nailers and have managed to narrow it down to a few six that we know can function very well with zero hitches. Besides, most of them are user-friendly and cost-effective in the end. You can easily afford to buy any of them and maintain it for optimal functionality. You will not even have to break the bank for maintenance costs. Moreover, these that made it to our top six brad nailer reviews of 2018 are highly versatile and adjustable when it comes to functionality. You can rely on them to deliver as stipulated. You just have to double check the user manual to ensure you are using it right and you will never regret coming across this brad nailer review. Brad nailers are often very effective when you want to fix a window or door casing as well as add some light trim crown molding or baseboards. Moreover, brad nailers are often very handy when it comes to home renovations, you can easily make upgrades with it as long as you have the skill sets and know-how. 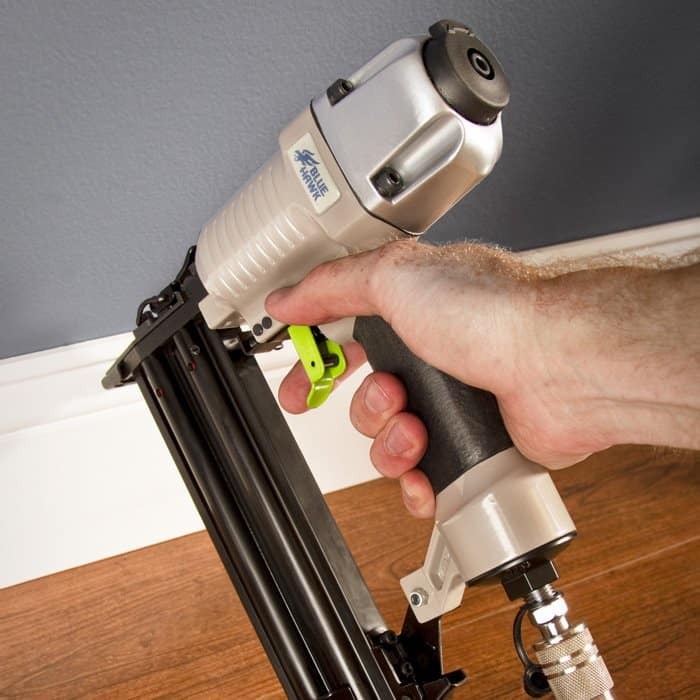 Brad nailers can be used to make chairs, cabinets and other sorts of furniture with a combination of some special adhesives to make them sturdy. You just need to have a quality brad nailer and some basic carpentry skills and you can make anything you want. You can use your imagination to create some picture frames, piece some broken wood trim together as well as make some toys using a brad nailer. You can even make some home or office crafts with it and other small-scale crafts. Brad nailers are very effective in securing parts of a building as well as other structures in place. It can nail things in different blind spots, making the site safer for working. Brad nailers and finish nailers are both ideal for carpentry. It is the nature of the woodwork that often differs, making each useful on its own platform. A brad nailer is often smaller when compared to a finish nailer. You can easily distinguish one from the other just by size. Brad nailers often use brads, thin gauge nails that are used to piece and attach together lightweight trims. Brads often have a thin flat head that is invisible over the wood trim. This ensures that you do not use any wood putty to cover the nail hole. 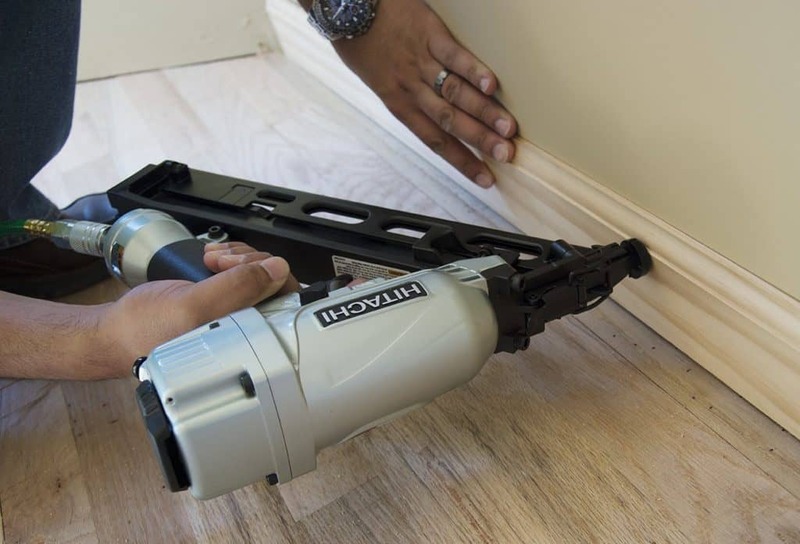 Besides, finish nailers can split any lightweight wood trim and their big nail heads often leave the wood with insertion holes, which needs to be covered for a clean finish. Finish nailers often use shorter, lighter nail gauge of 14-16 gauge that is 1-2 ½-inch in length. While brad nailers have lighter 18 gauge nails that are 5/8-2 inches in length. Finish nailers are often used for finishing only, just as its name suggests while brad nailers are highly versatile and can be used to patch, attach or frame any light wood trim in place. Evidently, a brad nailer is usually the best choice, if you have to make one. This is mainly due to its versatility when it comes to different woodwork projects. You can use it at home and work, construction sites. However, you can always invest in both, if budget is not an issue. There are mainly three types of brad nailers, corded, electric and pneumatic. This brad nailer uses compressed air. The air is fired via a hose, which energizes the compressor and powers the brad nailer. You just have to be cautious and exercise some safety, as its pressurized air is often hazardous. This is often the choice of many woodworkers as it is lightweight, works efficiently and allows for a clean finish. Pneumatic brad nailers are often cost-effective but constant hose replacements and oil checks often make it hard to maintain. However, it is highly versatile as it can hold different nail types and comes in different sizes. This brad nailer is powered by an electric motor that drives the brads into the wood trim. It is a bit heavier due to the motor. Nevertheless, it gets the job done very fast and efficiently. It works very quietly and can double as a staple gun. It is often a bit pricier than a pneumatic brad nailer but with time, it becomes cost-effective due to its minimal maintenance costs. Using and maintaining a brad nailer is not that hard, here is a look at how you can do both without any serious injury. First, you will have to decide on which brad nailer to use. This often depends on whether you have an air compressor or are always on the move, in which case an electric or corded brad nailer would be ideal. You should then exercise some level of safety no matter the type of brad nailer you are using. Brad nailers often exert a lot of force and power and if handled badly can cause physical harm. Ensure you have enough and extra brad nails to work with. Brad nails are often useful when it comes to fixing or hammering small trims of wood. 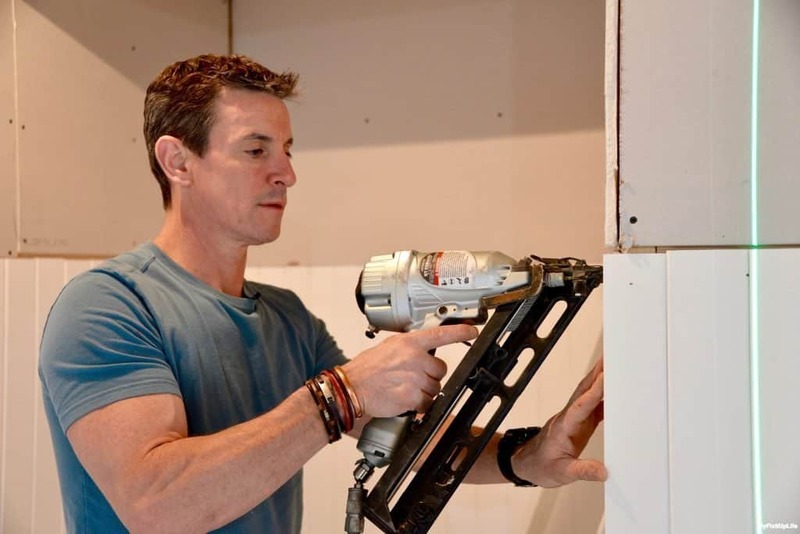 Likewise, you should use the right size or type of brad nail depending on the trim. As most versatile brad nailers often accommodate different sizes and types of brad nails. You can then start firing, making sure to aim at the correct angle. You can always make some pencil marks to ensure you have the correct position. Remember to also adjust the air pressure and get the depth of the fastener right. After you are done, you can store it in a secure casing or unplug its cord or air hose for safekeeping. Remember to wipe any debris from it to prevent any jamming or corrosion. Brad nailers are not an easy buy, especially if you do not know some of the ideal features to look for. You can rely on the list below as a simple guide to making any purchases. This will prevent you from making a faulty purchase. This is very important as some brad nailers will not be able to accommodate some brad nails due to their length. Most brad nailers often accommodate nails of 5/8 to 2 inches in length. Therefore, it is ideal to buy a brad nailer with a limit of about 2 1/8 inches. Nose size is important to ensure that the brad nailer will end up where you want it. Therefore, the smaller the nose size the better, especially for finish results. Besides, always opt for ones with non-marring rubber nose tips as they guarantee a clean finish. You should always consider your source of power. This will help you in choosing the most convenient type of brad nailer. You can opt for pneumatic brad nailers if you have an air compressor around or an electric or corded one if you can afford to. There are often two types of trigger, contact and sequential. Contact trigger often requires you to tap the object with the tip of the brad nailer for it to release the fastener immediately. Meanwhile, you will have to keep a hold of the trigger with your fingers. This can be dangerous, as the brad nailer can be activated instantly, no warning. As for a sequential trigger, you will have to push the tip of the brad nailer to the object and pull the trigger. It is the safest but can be tiring in the end. It is always better to buy a product with a longer warranty which also covers repairs and other malfunctions. What do I need to run Pneumatic Brad Nailers? You will need an air compressor and air hose in order to use any pneumatic brad nailer. What is the best air compressor to use with the DEWALT DWFP12231 Pneumatic brad nailer? You can always use an air compressor designed by California Air Tools, as they are known to be quiet and work very well. The only downside is their steep price but very worth it. What is the difference between an 18-gauge brad nailer and a 16-gauge finish nailer? You should note that the higher the gauge the smaller the nail head. Therefore, a 16-gauge finish nail has a bigger head while an 18-gauge brad nail has a smaller head. Besides, the bigger the head the bigger the hole but the better its hold on the woodwork. Can the PORTABLE-CABLE PCC790LA brad nailer be used for shed framing? No, as it only fires brad nails, and you cannot build or repair a shed with brad nails. 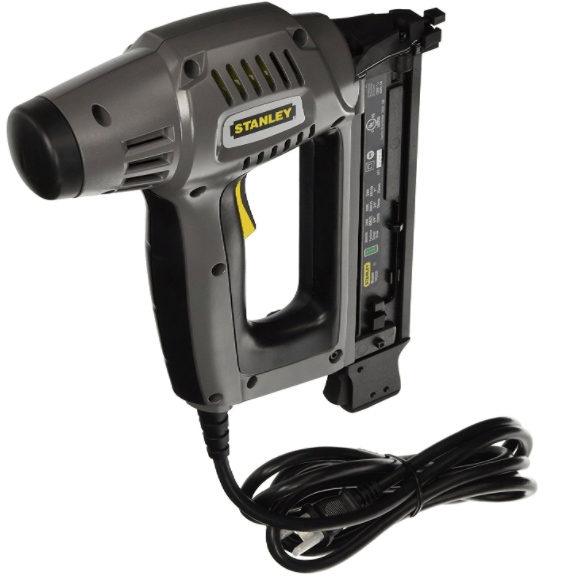 Would a 1-gallon compressor with 110 psi be able to run the Campbell Hausfeld brad nailer/ stapler? Yes, it would work very well with it. Does the Campbell Hausfeld brad nailer/ stapler take staples that are more than a ¼ inch? No, it can only accommodate ¼-inch crown, their length can range from ½ to 1 ½ inch. Does the PORTABLE-CABLE PCC790LA brad nailer come with its own storage case? No, it does not come with any storage case. What is the warranty coverage for the Campbell Hausfeld brad nailer/ stapler? It comes with a one-year warranty, effective from the day of purchase. Does the Max NF255F brad nailer have a dry-fire lockout? Is the Max NF255F brad nailer oil free? A few drops every now and then on its metal parts helps reduce any wear and tear that comes with constant use. Where is the Max NF255F brad nailer manufactured? The Max NF255F brad nailer is made in Thailand. Would the DEWALT DWFP12231 Pneumatic brad nailer stop and to tell you when the nails have run out and if it is time to reload? No, it does have that feature. Does the Hitachi NT50AE2 brad nailer come with a carry case? Yes, it comes with a plastic carry case. What size connectors are used for the Hitachi NT50AE2 brad nailer? It uses a quick release standard size. 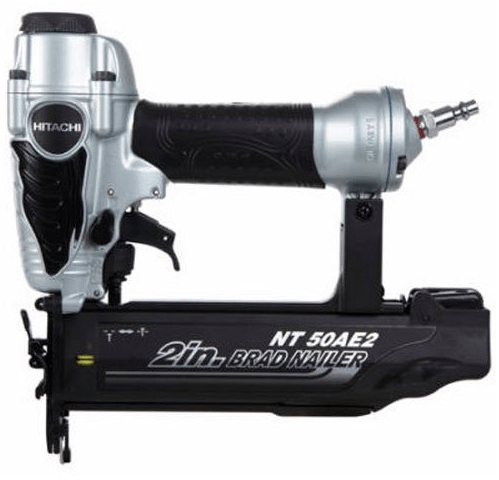 Do you make international shipments of the Hitachi NT50AE2 brad nailer? Final Words - Make Your Choice! It might seem like a lot but when you want to buy a brad nailer, our brad nailer reviews and buyer’s guide can help you make the right choice. You can rely on it to answer all your questions for an easier purchase. Moreover, we have skill-fully selected the 6 best brad nailers of 2018, meaning all the information is updated and very useful.